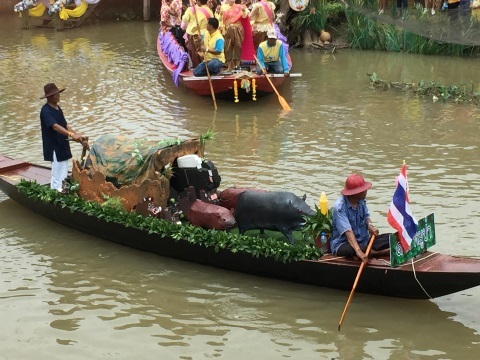 Welcome back to the August 2018 Bangkok Travelbug. 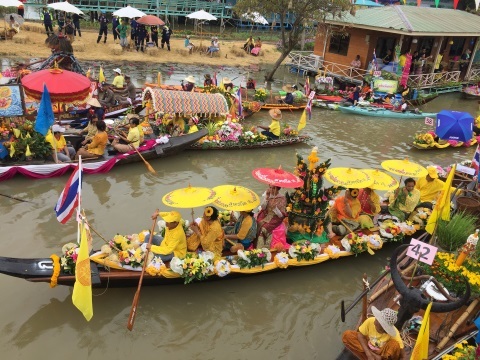 As promised, we re-visit Lat Chado for the Khao Phansa Boat Procession at the start of the Buddhist Lent. 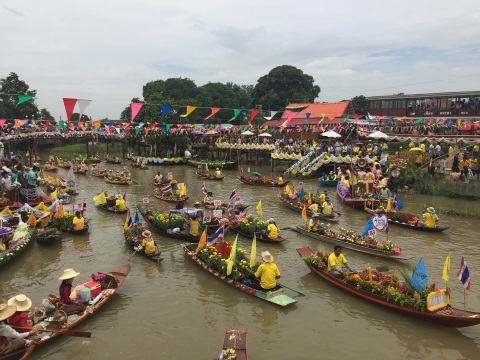 It was a beautiful occasion, so please join us for this colourful annual festival in Lat Chado, Ayutthaya. Khao Phansa falls on the first day of the full moon in the 8th lunar month, 28 July 2018 this year. This marks the start of the Buddhist Lent which lasts for 90 days till 24 October 2018, the 15th day of the rising moon in the 11th lunar month. This period coincides with the rainy season in Thailand during which monks and novices retreat to the temple for meditation. The Buddhist Lent is also a period to practise abstinence and selflessness. Asarnha Bucha is the day before Khao Phansa, it falls on the 15th day of the rising moon in the 8th lunar month, 27 July 2018 this year. On this day, Buddha preached his first sermon to his five disciples after he attained enlightenment. Buddhists observe Asarnha Bucha by offering alms at temples to make merit and in the evening hold a candle procession around the temple. Many communities start this procession from their homes to the temples. 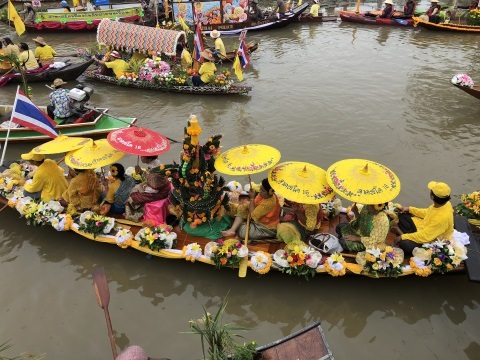 In the old days, this procession was done by boat, today vehicles are used. 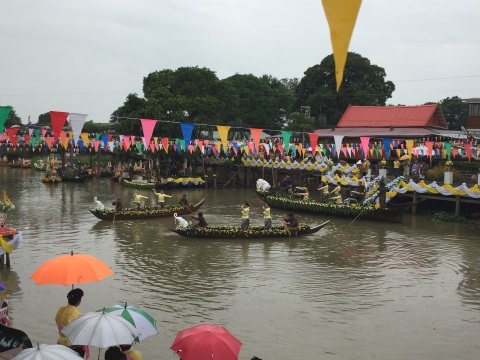 However, in Lat Chado, the boat procession has been revived to preserve this old tradition. Let’s take a look at this beautiful festival. On the morning of 27 July 2018, Asarnha Bucha Day, we arrived in Lat Chado slightly after eight. 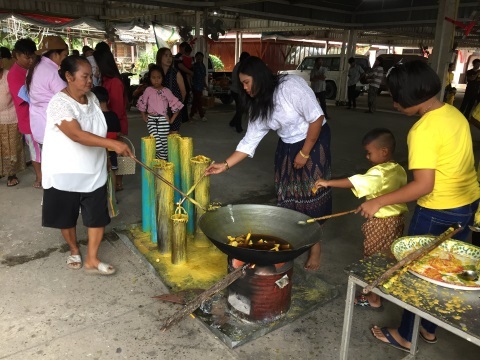 The community temple, Wat Lat Chado was packed with visitors making merit by offering alms on a holy day. Vendors selling a variety of food were doing a brisk trade with worshippers arriving to make merit. The sala kanprian (multi-purpose hall) was filled with people in prayers conducted by the monks before offering alms. Outside the sala kanprian people were queuing up to donate money in a box, take small blocks of candle wax to place in a huge frying pan to melt the wax. After which they took ladles to scoop some candle wax into tubes serving as moulds. When the wax hardens these candles will be offered to the temple for use. 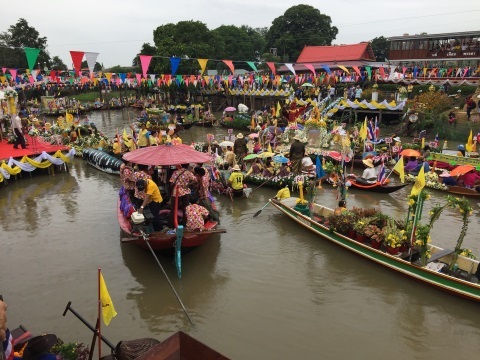 After visiting the temple, we passed through the market to get to the river banks. The Lat Chado Market in sharp contrast to our last visit was bustling. Almost all the shops were open. By noon, the market was completely packed, and the crowds were still streaming in. At the river banks, many boats were already assembled in the water waiting for the start of the event at 10:00 am. 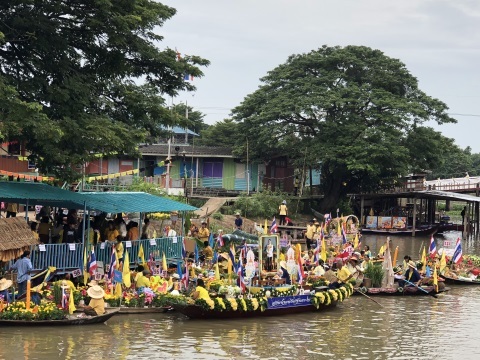 This was the 9th Khao Phansa Boat Procession organised by the people of Lat Chado following the traditional way of life in the past when people travelled around in boats. It was a wonderful opportunity to capture some memorable photos. 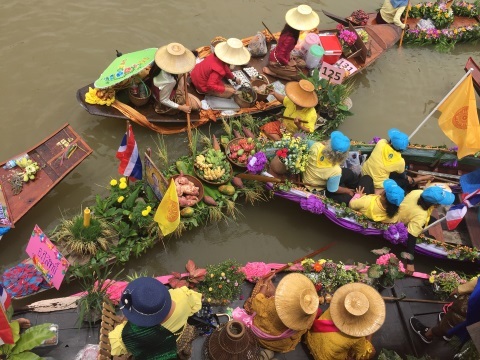 Rarely do we get to see such colourful sights on the river. 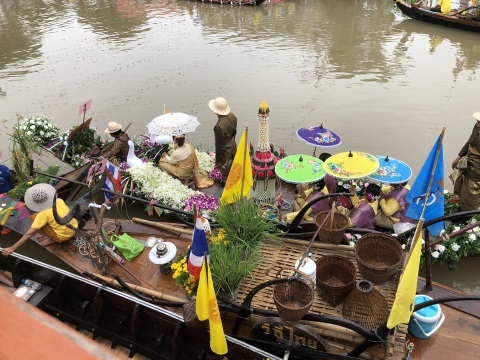 Boats were decorated in different themes, mostly agricultural. 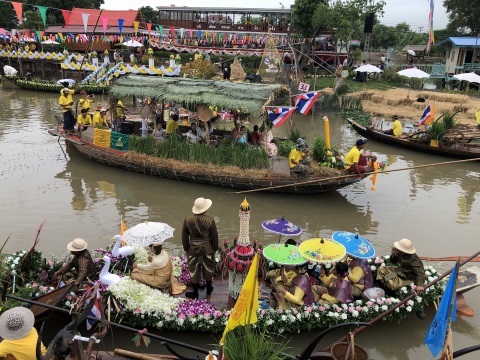 Many of the participants were dressed in traditional Thai attire, some were in period dress from the Ayutthaya era, others were in yellow, the royal colour. 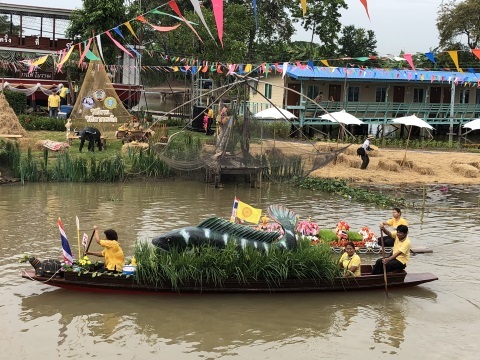 Some participants had different ideas, one participant used the pla chado (chado fish) as his theme, another disguised his boat as the chado fish! 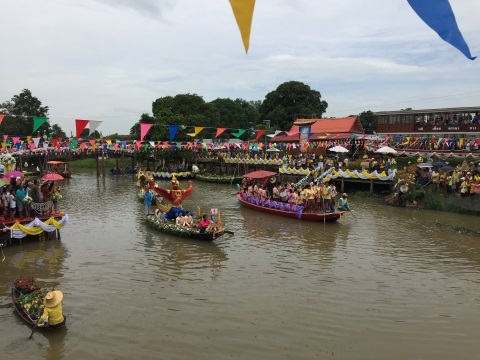 There was a competition to see which was the best decorated boat and judges were moving around in a boat during this waiting period to make their assessments. Boat vendors, who were also participants in the procession, were moving around in the meantime selling their wares. 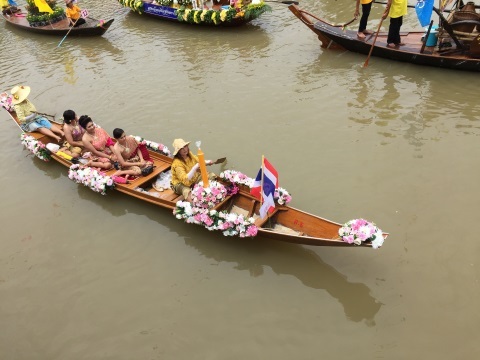 While waiting for the procession to start, visitors were entertained by singers and a magnificent performance by dancers on boats while the boatmen skilfully manoeuvred the boats in time with the dance. Here’s a video of that splendid dance performance. 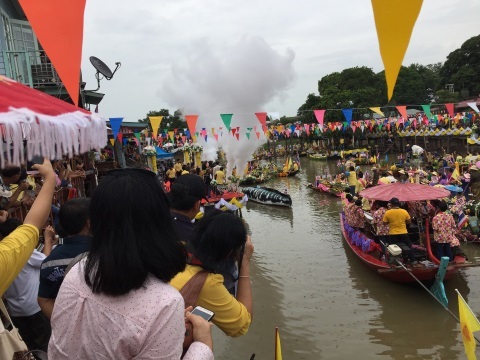 At ten when the Governor of Ayutthaya arrived for the official opening, boats swarmed around the stage to welcome him. These boats are best viewed when they are massed to bring out the vivid colours. After a short speech, the procession opened with a big bang of smoke and fireworks. Watch the video of the opening, you will almost feel as if you were there. 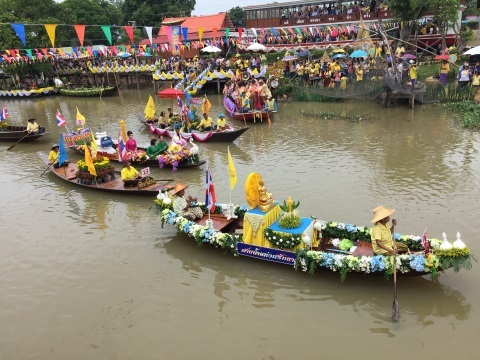 After that spectacular opening, the boats moved upriver to form up for the procession. We waited for about a half an hour before the boat procession came into view led by the music barge, with musicians and dancers. 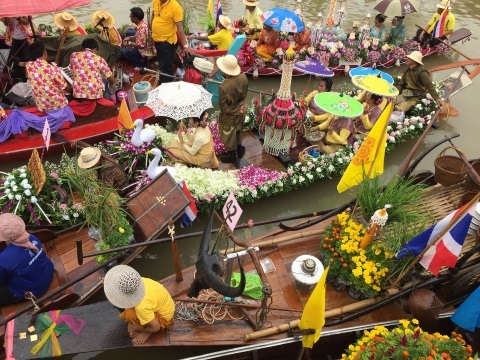 Bringing up the rear were the flower and fruit vendors in their boats loaded with flowers in various colours. 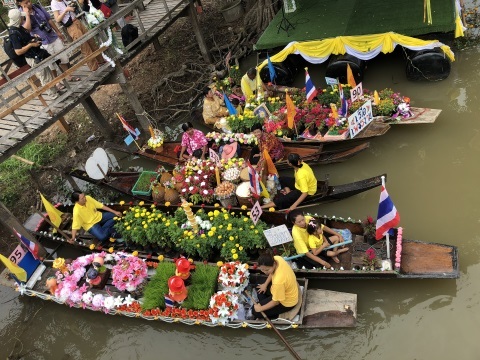 On passing the stage, some of them broke away from the procession and moved to the banks to sell their goods to the visitors, creating an instant floating market. Watch the video of the complete procession which took about 17 minutes. 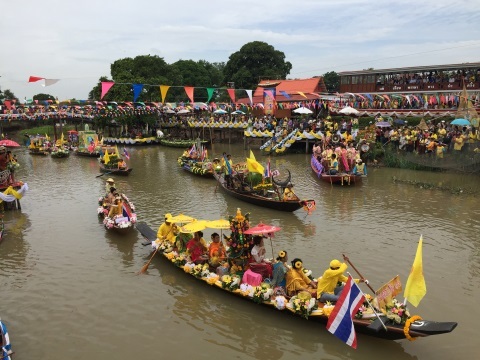 That brings us to an end to the Khao Phansa Boat Procession in Lat Chado, Ayutthaya. We hope you enjoyed the festival, see you again next month. 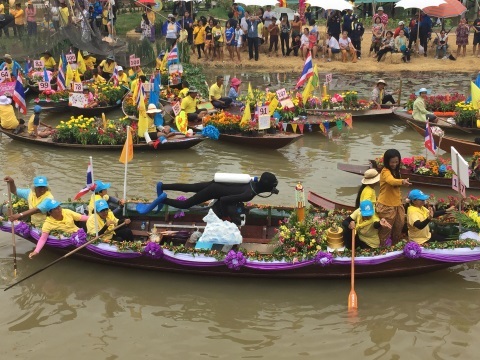 Our congratulations to the residents of Tambon (sub-district) Lat Chado and the officials in the Tambon Administrative Organisation of Lat Chado for organising and executing a wonderfully entertaining and colourful event. It must have taken a lot of preparation and hard work. To the people of Lat Chado, thank you for sharing this very special event with the rest of us. 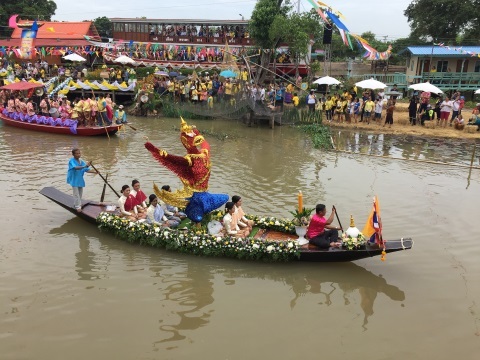 We leave you now with a short video of the closing scene on the river at the end of the boat procession, wonderful parting shots of a memorable occasion. From Bangkok get on to highway 1 (Don Muang tollway) – highway 347 – highway 309 – at the Pa Mok junction turn left to highway 329 – turn left at highway 3454 – turn right to highway 3050 – proceed on till you get to Wat Lat Chado. Do not enter the lane with the "Lat Chado Market" sign over it. It's very congested and there isn't enough parking space. Turn at the next the lane, the one leading to Wat Lat Chado. There is ample parking in the grounds of the temple. Mon temples in Pathum Thani.